Illustration of a unit circle. The variable t is an angle measure. Animation of the act of unrolling the circumference of a unit circle, a circle with radius of 1. Since C = 2πr, the circumference of a unit circle is 2π. for all t (see also: cis). 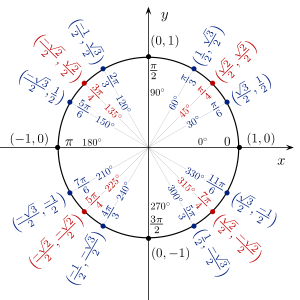 This relation represents Euler's formula. In quantum mechanics, this is referred to as phase factor. All of the trigonometric functions of the angle θ (theta) can be constructed geometrically in terms of a unit circle centered at O.
Triangles constructed on the unit circle can also be used to illustrate the periodicity of the trigonometric functions. First, construct a radius OA from the origin to a point P(x1,y1) on the unit circle such that an angle t with 0 < t < π/2 is formed with the positive arm of the x-axis. Now consider a point Q(x1,0) and line segments PQ ⊥ OQ. The result is a right triangle △OPQ with ∠QOP = t. Because PQ has length y1, OQ length x1, and OA length 1, sin(t) = y1 and cos(t) = x1. Having established these equivalences, take another radius OR from the origin to a point R(−x1,y1) on the circle such that the same angle t is formed with the negative arm of the x-axis. Now consider a point S(−x1,0) and line segments RS ⊥ OS. The result is a right triangle △ORS with ∠SOR = t. It can hence be seen that, because ∠ROQ = π − t, R is at (cos(π − t),sin(π − t)) in the same way that P is at (cos(t),sin(t)). The conclusion is that, since (−x1,y1) is the same as (cos(π − t),sin(π − t)) and (x1,y1) is the same as (cos(t),sin(t)), it is true that sin(t) = sin(π − t) and −cos(t) = cos(π − t). It may be inferred in a similar manner that tan(π − t) = −tan(t), since tan(t) = y1/x1 and tan(π − t) = y1/−x1. A simple demonstration of the above can be seen in the equality sin(π/4) = sin(3π/4) = 1/√2. When working with right triangles, sine, cosine, and other trigonometric functions only make sense for angle measures more than zero and less than π/2. However, when defined with the unit circle, these functions produce meaningful values for any real-valued angle measure – even those greater than 2π. In fact, all six standard trigonometric functions – sine, cosine, tangent, cotangent, secant, and cosecant, as well as archaic functions like versine and exsecant – can be defined geometrically in terms of a unit circle, as shown at right. Using the unit circle, the values of any trigonometric function for many angles other than those labeled can be calculated without the use of a calculator by using the angle sum and difference formulas. is a unit circle. It is a simplest case so it is widely used in study of dynamical systems. Look up unit circle in Wiktionary, the free dictionary.